The complete Gerberich story is to be found in "The History of the Gerberich Family in America" by A. H. Gerberich (1925). The description that follows is largely taken from that source. The earliest Gerberich was Hans who lived from 1613 to March 21, 1682, in the village of Altfeld bei Marktheidenfeld in the Spessart, Lower Franconia, Bavaria. His wife, Appolonia, lived from 1627 to 1690. Among their children were four sons - Peter (1651 - 1736), Nikolaus (1654 - 1727), Hans Kasper (1659 - 1720), and Andreas (1661 - 1734). Hans Kasper Gerberich was born March 18, 1659, and died March 6, 1720. On April 24, 1683, he married Appolonia Volz. They had ten children - Georg (born December 12, 1684), Andreas (born September 23, 1686 and died 1688), Anna Katharina (born September 25, 1690), Johannes (born in 1692 and died), Hans Thomas (born April 17, 1695), Andreas (born April 20, 1697), Martin (born July 3, 1698), Johannes (born June 9, 1701), Philip (born September 10, 1703) and Hans Michael (born July 2, 1710). Both Johannes and Hans Michael migrated to Pennsylvania to become the ancestors of generations of Gerberichs, Garberichs, Garverichs, Garbricks, and Gerbricks. Johannes Gerberich married, on February 25, 1727, Christina Schug, of the neighbouring village of Remlingen. Church records show that she was the daughter of Georg Schug (born February 10, 1654, died May 3, 1712), a soap refiner, and his third wife Anna Barbara Krauss (born 1678, died April 26, 1712) of Altdorf bei Nürnberg. Christina Schug was born May 14, 1703. Christina died April 4, 1736 in Michelreith and Hans married Christina Emmerich. His children who grew to maturity were , Peter (1730 - 1805), Andreas (1734 - 1795), Apollonia, Margaretha, Maria Margaretha, Johannes (1740 - 1805), Anna Barbara (born in 1743), and J. Michael (b 1748). Peter Gerberich and his uncle Michael left Rotterdam for Pennsylvania on July 12, 1751, arriving two months later at Philadelphia. They settled in Tulpehocken Township, Berks County, where they were joined the following year by Johannes and the rest of the family. It seems that Johannes Gerberich was killed in an Indian massacre on November 16, 1755. Peter Gerberich was born on August 12, 1730, and settled in Berks County, Pennsylvania, after his arrival in September, 1751. On February 9, 1755, he married Anna Margretha Rudolph of Atolhoe, Berks. He apparently had a second wife, so it cannot be said who was the mother of his twelve children. (York County records show that he married Anna Margaret, widow of Clement Ruhl, after 1776.) Peter settled in York County, Pennsylvania acquiring land near Glen Rock in 1773. Peter died on August 13, 1805, and was buried in the graveyard at Fissells Church near Glen Rock. According to his will his chil&en were John, Frederick, George, Michael, Jacob, Joseph, Margaret, Maria Elizabeth, Susanna, Catherine, Barbara, and Eve. George Gerberich was born July 4, 1774, and died December 6, 1838. He married Charlotte Frazer (daughter of Peter Froscher and Catharina [Krebs? ]), who was born February 8, 1776, and died November 8, 1825. They lived in Codorus Township, York County, Pennsylvania, and were both buried at Fissells Church. Their children were John, George, Elizabeth, Catherine, Samuel, and Levi. George W. Gerberich was born April 2, 1807, and died July 5, 1863, according to his tombstone in Houserville Cemetery, College Township, Centre County, Pennsylvania. His first wife, Susanna "Ann" Hoy, was born November 1811 and died December 8, 1845 according to her tombstone at Jacksonville, Centre County, PA. She was a daughter of Henry and Catherine Hoy, according to his will. Henry Hoy was born on August 1, 1771, at Tulpehocken, Berks County, to Albrecht Heu, according to records of the Blue Mountain Church there. He was an early settler in Centre County, who married Gertraut ___ (2 children) and Catherine Voneida (dr of J. Philip & Hannah (Reed) Voneida) and died on September 16, 1858, according to his tombstone in Marion Township, Centre County. George Gerberich followed his uncle Joseph to Centre County in the 1830s and began farming in Marion Township. The children of George and Ann Gerberich were Catherine (1835), Amos (1837), Rebecca (1838), Henry (1840), Emmeline (1842), John (1844). George married second Susanna Vonada who was born in December 1812 and died on October 29, 1883, according to her tombstone at Shiloh Cemetery, College Township, Centre County. She was a daughter of Nicholas and Anna Maria Voneida. Their children were Levi (1847) and Anna (1849). Henry Garbrick was born on October 16, 1840, and died on April 18, 1863, according to his tombstone at Houserville, College Township, Centre County, Pennsylvania. His wife was Catherine Poorman, who was born on January 19, 1846, and died on October 10, 1925, according to her death certificate. She was a daughter of Wilson and Anna (Grove) Poorman of Centre County. Henry and Catherine Garbrick had two children - George, in 1861, and Annie Elizabeth, in 1862. George was listed with his Poorman grandparents in 1880 Missouri and then settled in California. After the death of her husband Catherine Garbrick married her cousin, Solomon Poorman, and had three more children. 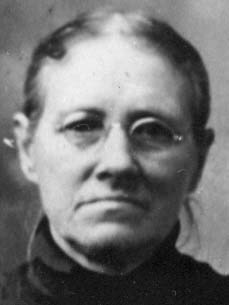 Annie Elizabeth Garbrick was born in Benner Township, Centre County, on July 9, 1862, according to her death certificate. She married Frank Wion on November 29, 1883.